The Downchild Blues Band-The Partland Brothers > Rick Fines > Ragged Company > MaClay Experience > www.keithrichandthepoboys.ca > Jerome Godboo Band. The event also featured a silent auction, beverage tent provided by the Lions Club and Sirch, tours of the hatchery and several food vendors. 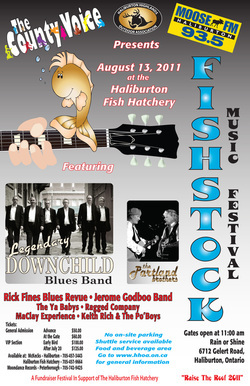 The Fishstock committee of the Haliburton Highlands Outdoors Association has decided to postpone the event. We are disappointed as there was great support from various rock legends including April Wine, Coney Hatch, David Wilcox and new acts like Walk Off the Earth in addition to a number of local bands. In March, the HHOA funding sources to help festivals and events grow and attract more visitors were not approved due to record number of applications. These were a key part in the festivals growth strategy. “That was a big disappointment because we had planned to use that funding to expand the event and bring in bigger bands and make it a signature community event”, says John Teljeur Vice President of the HHOA and co-producer of the event. The current uncertainty in the economy also had an effect on the various corporate sponsors that had expressed an interest in participating in the community event. Says Teljeur,” Last year we had a lot of corporate interest in getting involved with 2012 but that changed as time went on and the economy became more uncertain”. Fishstock Music Festival was created by the HHOA to bring awareness and generate funds for the HHOA and the various programs they run including stocking 50,000 fish into County lakes each year. The event also partners and raises funds for local community groups such as SIRCH and Community Care. The Haliburton Highlands Outdoors Association in a non profit volunteer group dedicated to supporting and promoting outdoor activities, environmental, conservation projects and tourism in our region.